This is a photograph of my Grandad Walter George Dunkerton born in 1903. 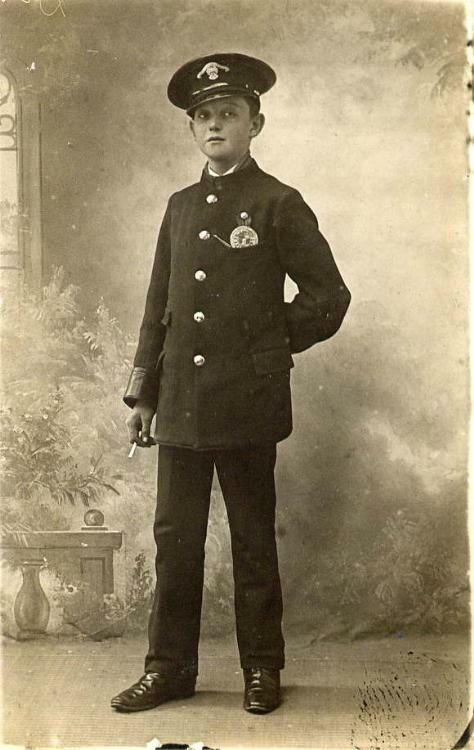 He was about 14 when this picture was taken to commemorate the start of his job as a Tram Conductor and would be about 1917. He later went on to form Dunkerton’s Removals with his brothers. Could this be the son of George and Florence Dunkerton? Dunkerton was a very unusual name in the Brighton area, and George and ‘Florie’ were married in Brighton in 1899. They are ancestors of mine. I used to go around with Don Dunkerton – dancing at the Regent and members of the Woodcraft Folk Camping at its best. I have now checked the 1911 census. This is my great grandmother’s cousin. His parents (George and Florie) lived in Ewart Street, and later Nesbitt Road. This is my great grandfather! George and Florrie had three sons, Jack, Fred & George. My grandfather was Fred who was the last ancestor to run the family business. From Nesbitt Road they moved to Bonchurch Road, my father Ted also worked in the business for a period of time. The person who mentioned Don was the son of George, unfortunately he is no longer with us as he died a relatively young man (about 60 I think). There are still a few Dunkertons around in the Brighton area and are all related! My father’s sister married a Dunkerton who was in the removal business in Brighton’s Nesbit road. I used to visit them and I think her name was Mary? His sisters name was Rene Taylor from Lincoln cottages, Brighton. It must be the same. My fathers name was Harry Freeman. The picture above is my great grandfather, my father Harry also worked for Dunkerton Removals and he is the brother of Ted Dunkerton mentioned above. I am also the cousin of Mary Burt formerly Mary Dunkerton. Hi I run a website dedicated to British tramway Company uniform badges and buttons. I would love to add this photo to my Brighton Corporation tramways page (http://www.birches.plus.com), along with as much background information as possible, especially as the badges were changed in later years, which makes this an early example. Do you know how I can get in touch with Mr Banwell to request permission? My site is completely non-commercial – just a hobby. Editor’s note: Unfortunately Ashley we do not have current contact details for the author of this page. Without specific permission from the owner of the image, usage is only permitted for personal/research, which does not cover usage on another website. Sorry we are not able to help. Perhaps you could post on our Message Board asking for help with your project? There are quite a number of very knowledgable local historians who oversee the board and may be able to assist you. I read with great interest about Harry Freeman, my grandad. I love to read/hear about life in his days. I only knew him for a brief period as a child before he passed away. (Chris Ray,Maureen Freeman and Joyce are my aunts and uncles). I used to visit my aunt may and uncle Fred Dunkerton in Bonchurch Road and my cousins Ted and Harry used to give me and my brother Micheal a ride in the big lorries. Our mum no longer with us, Rene Taylor moved to Bonchurch Road so it always bought back memories. In the late 1940’s I went to Moulsecomb school with a Donald Dunkerton. In 1950 we moved to Southampton, but I met Don again when we were both at the Police training school at Sandgate. He was in the Brighton force and I was in the Southampton force. Is this the same Don who passed away at an early age?